The Historic Riding Hall in Eutin has been the home of the Neustettin Heimatmuseum since 1992. After twenty-six years, that chapter has come to a close. For many, this feels like a second expulsion as the museum has served to keep the memory of the former Pomeranian Kreis Neustettin alive. With the renovation of the Historic Riding Hall, the museum’s holdings must find new homes. In the future, a Eutin and Ostholstein focus is targeted with an emphasis on the flight and expulsion after World War II. Photo from Mein Neustettin. Visit http://www.neustettin.eu/Heimatmuseum.html for more pictures of the Heimatmuseum. For members of the Neustettin group, this was a difficult reality to come to grips with. The museum was only open for two hours on Wednesdays and only garnered 261 visitors last year. However, for the chairman of the municipal council, Dieter Holst, the decision to terminate the lease on the space was eased by the fact that the museum’s holdings will be parted out to other entities. Writings will go to the Martin-Opitz-Bibliothek in Herne and the Archive of the Pommerscher Greif in Züssow. The exhibits go to the Pommersche Landesmuseum in Greifswald, the Foundation for Flight, Expulsion and Reconciliation in Berlin, and to the Village and School Museum in Schönwalde. Photos of the museum prior to its closing can be viewed here. 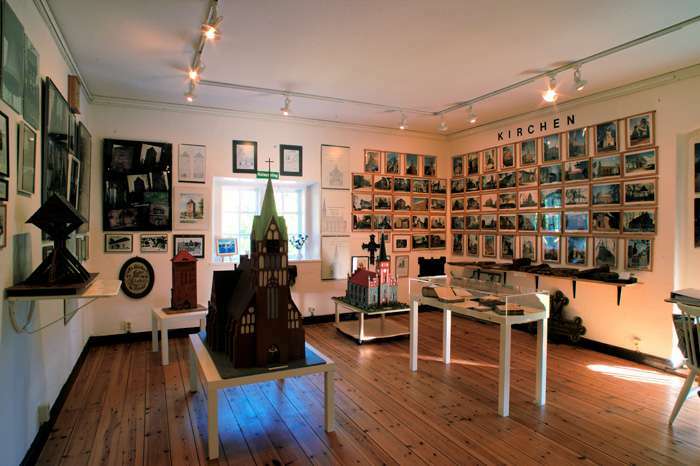 A bittersweet concession for those who had hoped to visit the museum but are now unable to, a film was made to document the Neustettin Heimatmuseum prior to its closing. Wolf Kamlott from Studio Klingberg videoed the exhibits as they were and interviewed former residents and descendants from Kreis Neustettin. The video will be available this autumn on both the website for Heimatkreis Neustettin and on YouTube. To learn more about Neustettin’s history, view pictures and maps, and to locate resources for family history, please visit the websites Heimatkreis Neustettin and Mein Neustettin – eine Perle Hinterpommerns.